This post is dedicated to Mrs. Linda, you have my apologies for not having this information front and center! For the Mylar Bags we sell at Advice and Beans (Discount Mylar Bags), there are a number of ways to seal them, including with a straightening iron, some vacuum sealers, and a hot jaw sealer. 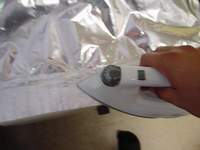 As most everyone probably has a clothes iron around, here are instructions for using one to seal Mylar. 1. Place the bag on a flat surface. The two sides of the open end of the bag must be flat and without wrinkles. 2. Set the iron to “wool.” The wool setting will be warm enough to seal most Mylar bags. Thicker bags may require a higher setting. You do not need to place a cloth or anything in between the iron and the surface of the bag. IMPORTANT: The material of our bags has been designed with a heat resistant outer layer. We accept no responsibility in attempting to do this with other packaging materials. Please note you can melt even the outer layer if your iron is set too high or you keep the heat on the bag for too long. 3. Seal the bag closed with the iron. Go over the bag several times in a three to four inch wide band creating a wide seal area. Watch closely for even small wrinkles. A small wrinkle in the seal can remove 95+% of the barrier proprieties of the bag. Futurism, or looking into the impacts of technology and trends on the future, doesn’t sound like it would parallel with a preparedness lifestyle, but the two have been on my mind lately. In my main career, I’m moving into a new Procurement position with much greater scope and responsibility than my previous, one that will require analysis of long term trends and the use of cutting-edge technology. As owner of a small business based on preparedness, discussions generally revolve around concepts and technologies that have been around for several thousand years. I saw an article at the Futurist today (h/t Instapundit) that contrasts two similar concepts. While many economists have always seen deflation as a sign of economic distress and weakness, the article instead makes the argument that deflation up to a certain point is now caused is caused by advances in technology, not more dollars chasing fewer goods. He also argues that inflation is unlikely (I’m much less convinced of this point) unless we are able to overwhelm the ‘techno-sponge’ by injecting vast liquidity (cash from the printing presses) into the market. I think most of us are highly aware of the very visible food and energy inflation of the past several years. Whether this is offset because our LCD Flat-panel TV costs half as much is probably open to debate. The first two are necessities while the other a luxury. While it is always prudent to be prepared, I also think it is wise to understand that the future holds great promise as well. We are probably only 15 years away from realistic ways to extend our lifespans, virtual reality that will open vistas and possibilities that would seem like sorcery 20 years ago, and handheld PC’s with more power than today’s desktops. While the possibility of an economic collapse, EMP, society altering event are all there, so is there the possibility of a future of immense prosperity. You are currently browsing the The Food Storage Blogblog archives forAugust, 2010.